Footprints in the Butter: Evidence That Demands a Verdict - Coming October 3! 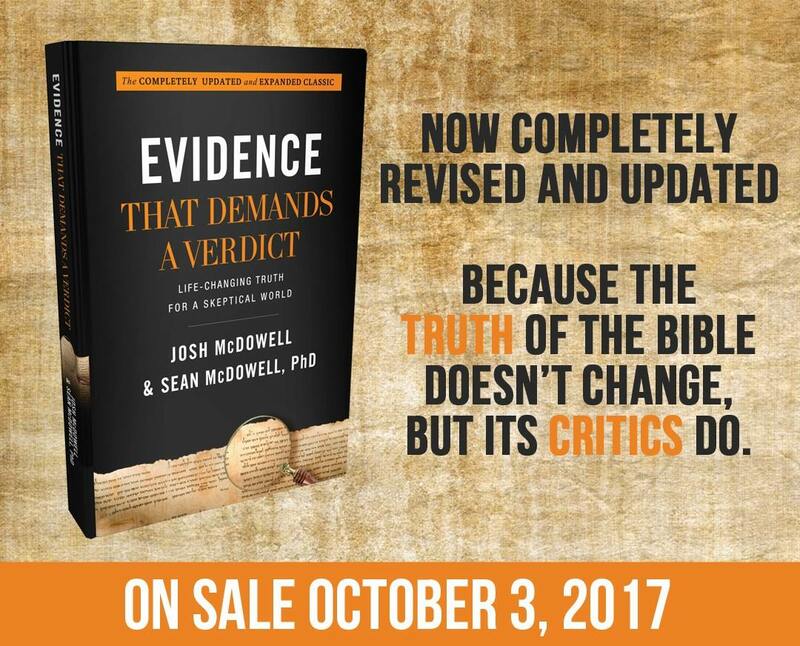 Evidence That Demands a Verdict - Coming October 3! I spent the past couple of days taking my high school senior and sophomore to visit their brother in college. They do a weekend event, Focus, where high schoolers get a chance to come, attend some classes, hang out, and learn a bit about the school. I ended up staying in the home of a couple who are on staff at the school. We stayed up at least as late as the boys did on Friday night. Both of my sweet hosts work at the school. She is the registrar. He (among other things) teaches an apologetics class to seniors. We were discussing books in general, and she was giving him a bad time about how many books he's purchased in the past month. He told her that he'll be purchasing a couple more here shortly, as the brand-new, fourth edition Evidence That Demands a Verdict is coming out next week. As I have been reading a digital version of that updated book, I perked right up. The original Evidence That Demands a Verdict was one of the very first apologetics books out there that was actually accessible to normal people. 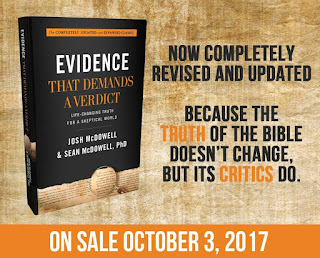 Josh McDowell did a fantastic job of laying out the evidence, the rational reasons, for the Christian faith, and that book (and revisions since then) have been a huge help for so many people in defending their faith. But this book didn't just need a bit of updating to release a fourth edition. It needed far more than that. The tagline attached to a lot of what I've seen about this is "Because the TRUTH of the Bible doesn't change, but its CRITICS do." Life is a lot different than it was in the early 70s, and the criticism of the Bible and of believers has certainly changed as well. So Josh -- and his son Sean -- set out to make this classic more relevant for today. Josh talks about some of the changes in his audience forty years ago vs. today. I doubt it would surprise too many folks that the idea of whether or not truth even exists is one of the biggest changes. That is why my host is interested in this book, and we talked about that. He is convinced this book is going to help in reaching millennials. I think he is right. This book is significantly different -- lots of brand-new content and quite a bit of what was in the book has been significantly updated. I have really enjoyed reading it, even though I find it challenging to read a pdf book. I'm really looking forward to receiving the hardback that I bought, which shipped this morning and should arrive tomorrow! I think this is something I will be going through with my kids. Even though there are so many choices out there today that can help you to know why you believe and help you defend your faith, this book ranks up there among the very best. If you are going to have one such book, this is the one to get. I seriously think this is a book that everyone should have. You still have a day left to pre-order, and if you do so, there are some bonuses available. Check out ReadEvidence for more info on that. And more videos and other information too! Disclaimer: I received this ebook for free . No other compensation was received. The fact that I received complimentary products does not guarantee a favorable review.